Super Bright illuminated LED address numbers are recognized nationally as the standard for clearly visible address numbers, night and day. The bright white LEDs create a highly visible glow that illuminates the entire digit at night. Super Bright Address Numbers will ensure that your home can be easily found by both emergency and delivery personnel. Whether its a pizza emergency or a medical emergency, your home will easily be found. Super Bright numbers are energy efficient and cost only pennies a year to operate. The assembled numbers and power supply module feature an energy efficient 5V plug-in transformer and a photocell that illuminates the numbers during darkness and turns them off during daylight. Super Bright numbers are maintenance free and weatherproof. They are a welcome addition to your home and provide peace of mind that your house is easily found in case of an emergency. NOTE: POWER SUPPLY SOLD SEPARATELY. Made from 500 million year old natural Canadian slate, these numbers are the perfect accent to every home exterior. Each number plate, measurnig 5"x 7" is handcrafted by skilled tradesmen to create a piece that is made to last a lifetime. Each piece is made from natural un-fading black slate featuring a 4" high number in white litho chrome paint. Mounting hardware and installation instructions provided with every piece. You may wish to illuminate your numbers by adding an Enviromate Products "Solar Light Source" (Home Depot instore sku# 496834). 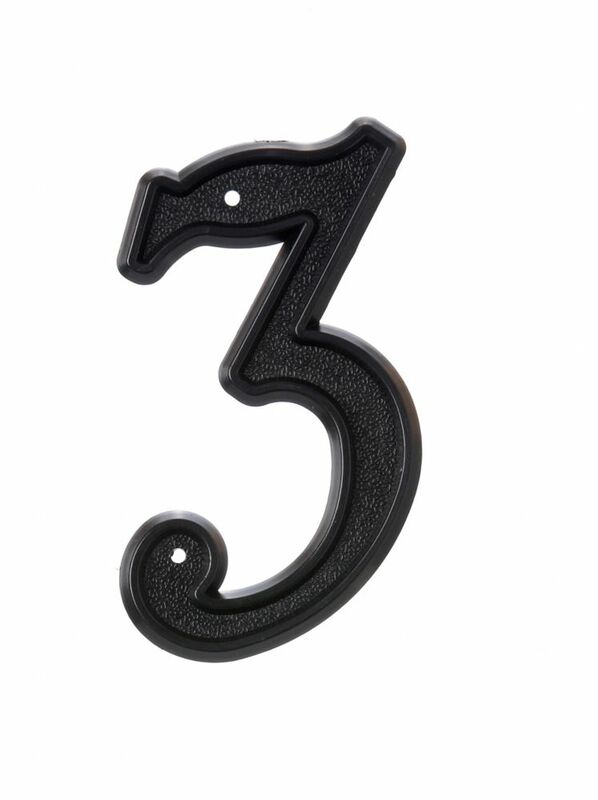 6 Inch Black Plastic House Number 3 Accent your house with the Hillman Distinctions line of house numbers.